Slanguage is a blend word that comes from slang and language. Slang is a particular kind of colloquial language, which comprises extremely informal language; usually known as buzz words. It helps to make speech vivid and colourful and creates group solidarity, but essentially belongs to young people. Though mainly used in speech, it can also be a regular feature in the popular press in England ( freesheet newspapers or tabloids in England) . Slang words date quickly, it is extremely difficult to keep up-to-date with brand new slang words, many phrases are used universally, for example the acronyms LOL and OMG ( and for that you can blame rap music, Facebook, twitter, and popular TV programmes like Skins and Hollyhoaks). Nevertheless, there are different variations according to the area of the UK in which you are. 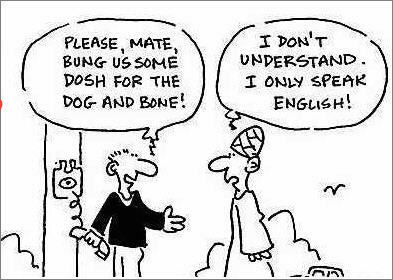 (In London, they use the cockney rhyming slang such as dog and bone ( the phone ). I will write another post about cockney rhyming slang soon!!! “John’s girlfriend is pure stunnin’. But she was ragin’ cos he dogged her out of it to got to the pictures with his muckers. She pure went into one and booted. It was some craic. “ John´s girlfriend is well fit, but …he wanna chillo ut wid his m8s rather tan take her to the film. She got like well lairy and she legged it. LOL”. Article from BBC NEWS -`Say what? A parent´s guide to UK teenager slang´. 1.Expressions for money : dosh, bread, the fuzz. 2.Expressions for the police : the pigs, the filth, the cops. 3.Expressions for being drunk : legless, pissed, paralytic, sloshed. 4.Expressions for the lavatory : the loo, the bog, the lav. 5.Expressions for alcohol : bevvy, booze. ← Welcome to the English class ! !